The Iron pillar, Alai Minar, Alai darwaza. The Qutub Minar possess five different storey’s marked through projecting balcony also tapering from a diameter of 15 m from the base till 2.5 m above the platform. The initial three storeys are carved by red sandstone whereas the 4th and 5th storeys are made of sandstone and marble. The basement of the tower possesses the Quwwat-ul-islam Mosque, very first mosque constructed in our country. Towards its eastern gate there is an inscription which depicts that the Qutub Minar was constructed with the source obtained from knocking down 27 Hindu temples. The courtyard of mosque holds a seven meter height pillar made of iron. There is a belief, that if one could encircle the iron pillar with their hands in a standing position with their back towards the pillar, then they can accomplish their wish. 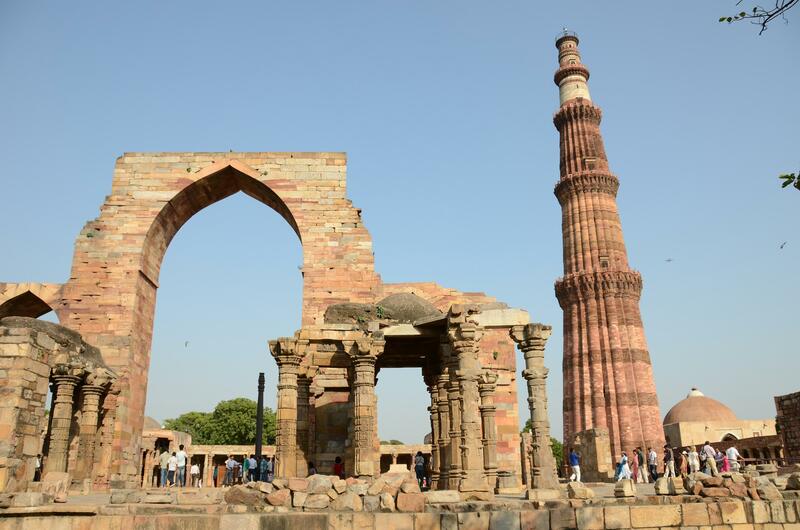 The Qutub Minar is a powerful tower that had come across various events in the capital state which are of great historical importance but it stands among all the destructions and it is still in the same position tall among all the wreckage. The area is totally under the care of UNESCO and it holds the credit of being amazing and awesome as per the comments of visitors. About three million numbers of visitors tour the Qutub Minar on a routine basis and are spellbound by its grandiose experience. There is a wonderful garden in front of the Qutub Minar which permits visitors to rest for a while and enjoy their tour in an unforgettable manner. The first and foremost Muslim ruler in Delhi, Qutab-ud-din Aibak initiated the building process of Qutub Minar in the year 1200 AD. He was able to finish only the construction of the basement. It was then followed by his successor, IItutmush who constructed three storeys. It was then followed by Firoz Shah Tughlak in the year 1368 who build fifth and last one. The progressive development of the architectural style right from the Aibak to Tughlak is clearly visible in the Qutub Minar. There is a difference in the relief work and also the construction materials. The Qutub Minar in Delhi was built by Qutab-ud-din Aibak during the year 1192, who is the founder of the Slave family and was then completed by his successor and son-in-law IItutmish. Situated as an elevated tower in the capital state, it is made of sandstones and brick tile. It is an amazing art which acts as a wonderful architectural art of the Indo-Islamic Afghan culture. One of the unsurpassed illustrations of Indo-Islamic architecture is the brilliant brick minaret used in the construction of the Qutub Minar. With an elevation of 72.5 m, with a circular staircase of 379 steps which ends to the top, the building is a minaret of five storeys. Constructed in a gradual decreasing order towards the top, the basement of the Qutub Minar is of 14.3 m diameter, whereas the top most floor possess only 2.75 meter diameter. Qutub-ud-in Aibak, the grand slave empire king initiated the construction process of Qutub Minar with the first floor. This was then followed by Sultan IItutmish who builds the successive three storeys. In 1368, Feroz Tuglaq constructed the fifth and last storey. The first floor of Qutub Minar is made of red sandstone whereas the remaining storeys are built of sandstone and marbles. There is an inscription from versus of Holy Quran, floral motifs, few intricate carvings and arabesque in this holy tower. They took twenty years to accomplish this marvelous building with a diameter of 14.32 at its basement and 2.75 m diameter towards its top. Surrounded by few illustrations of the Indian artwork, this wonderful building will definitely behold one’s attention at the first sight with its amazing altitude and architectural excellence. 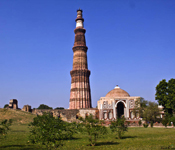 Qutub Minar can be easily reached by Delhi Metro services (DMRC). Metro facility is available from Gurgaon and Central Secretariat. One can board Delhi Metro from any station and carry on the rail route to reach Qutub Minar. The tourist spot can be easily reached with the help of DTC buses. 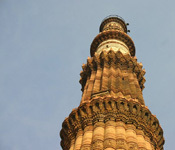 There are tourist packages available with Delhi tourism covering Qutub Minar. One can also hire private taxis, auto or cars. The Qutub complex which possesses this amazing minaret also holds the debris of some of great Delhi monuments. Iron Pillar is situated in the famous Qutub Minar complex which was constructed in the Quwwatu’I-Islam courtyard. This iron pillar holds the credit of the 4th century and is embellished with the Sanskrit inscription of Gupta script. There is a belief that if anyone can hold the pillar with their hands (behind their back), they can accomplish their wish. There is Quwwatu’I-Islam Masjid located in the Qutub complex. There is a belief that this famous mosque was constructed on the debris of the Hindu temples that were demolished to indicate the initiation of Muslim epoch in our country. Alai Minar was initiated by Alauddin Khalji, but emperor faced his death before the completion of this structure. This was constructed to match Quwwatu’I-Islam Masjid. Ala-i-Darwaza is the south gateway to the Quwwatu’I-Islam Mosque constructed by Ala-ud-Din Khalji. Situated towards the north-west of the Quwwatu’I-Islam mosque is the tomb of the IItutmish, built by Shamsu’d-Din IItutmish, the successor and Son-in-law of Qutub-ud-din Aibak. Shamsu’d Din IItutmish has constructed this tomb in the year 1235 A.D for himself. The major activity liked by most of the tourist in the Qutub Minar is the Sight-seeing. There are various ancient structures constructed inside Qutub Minar complex which is wonderful enough to behold one’s attraction at the first sight. Apart from sightseeing activity, one can also engage in Photography sessions. This is an excellent site to catch some brilliant snaps to preserve as beautiful memories. Don’t visit in the scorching summer season (March-June) where the day temperature goes to maximum of 47 degree C. Literally best to avoid touring Delhi during hot summer months (April-June). Winter season (December – February) are extremely chill where temperature may drop to one degree C. The month of January is very foggy with disturbed traffic. The monsoon months (July – September) are marked with heavy rains with intermittent flood. The gardens present in Delhi gets enlivened up at the time of monsoon season. The ideal time to tour Delhi is during July- February. It is advisable to avoid the extreme winter season which comes during the month of January, with the presence of heavy fog indefinitely delaying the flights because of poor visibility. The months of July – September is ideal to tour the city along with sightseeing. One should keep a vision on the road blockage because of rains. The month of October to December is best suited for all sightseeing activities inside and outside Delhi. January month may be foggy and chilly thereby obstruct the activities in the early morning. February and also March are very pleasant and ideal for outings.